In more than fifty years as a course designer, in steady demand all over the hemisphere and beyond, Pete Dye has worked on, inspected and examined untold hundreds of land parcels. But it’s doubtful he ever encountered a more inviting piece of raw property than the 460-acre wooded valley that eventually became the Honors Course. Building it was a burden, but playing The Honors is beatific, one of the most tranquilly enjoyable experiences the game offers. The location is the rural southeastern Tennessee village of Ooltewah, some ten miles from Chattanooga. 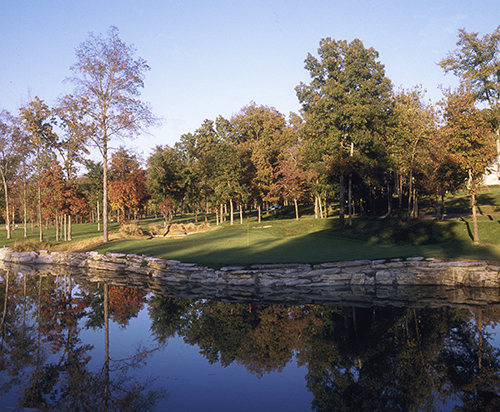 Ringed by nearby White Oak Mountain, peppered with dogwoods, hickory trees and other native hardwoods, covered in bluegrass and native fescues, home to dozens of bird species, including wild turkeys, this is as natural and unspoiled a setting for golf as one can ever hope for. But Lupton’s demands likely paled in comparison to the demands of the terrain. Fleets of bulldozers relocated hundreds of tons of dirt. Dynamite blasts roared in the valley, dislodging stumps and imbedded limestone. Felled trees with massive canopies were buried in gaping chasms. Lakes were dug, filling with rain that never seemed to abate. Viscous Tennessee red clay and a sedimentary rock called chert, the latter which became a four-letter word to Pete, caused more trouble. But when the trials and travails of building were finally done, the end result was one of the most spectacular, yet serene creations in the voluminous Dye oeuvre. It’s no wonder the club has played host to the U.S. Amateur, Mid-Amateur, NCAA Championship and Curtis Cup, among other important events. Each hole is an entity unto itself. Despite the earth-moving, fairways seem to run with the natural contours of the land. They dip and bend just enough to cause the occasional uneven lie. Two manmade lakes, totaling nearly thirty acres, provide a threefold advantage: They’re a water source, a different visual perspective from the heretofore rolling meadow sensibility, and add a healthy measure of angst on several tee shots and approaches. All 18 holes are real yeoman’s work, but the apex of the round comes early through the inward nine. These highlights include the robust, downhill par-5 11th, the petite dogleg par-4 12th, the left-sweeping par-4 13th, with its canted green, and the short 14th, a simple one-shot hole over acres of gnarly, waving fescue grass. 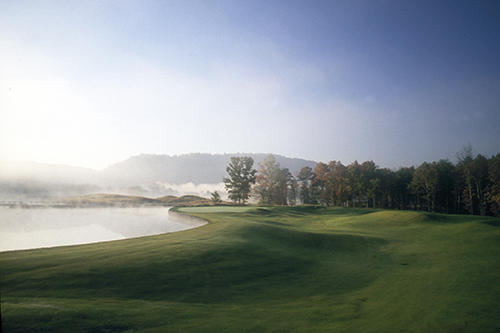 This hole, perhaps more than any other, distills the Honors down to its organic essence. So it’s ironic that Pete Dye originally designed the hole with a massive waste bunker from tee to green, before the autocratic Lupton ordered it changed. He reprimanded Dye, saying, “This isn’t a Florida golf course,” and the sand was quickly replaced with an intimidating field of native grasses. Speaking of grasses, though there are many varieties on the property, including the different fescues and native broomsedge, the most essential is the resilient Zoysia fairways, which help make the course so enjoyable. It’s springy underfoot, props the ball up, and is resistant to the temperature extremes of the area. 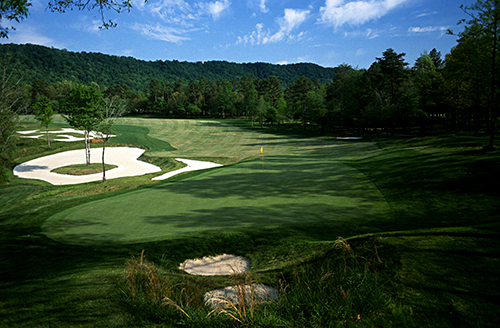 In the playing, the heavy-duty fans circulating air on the greens are the only modern-day intrusion. In many ways the course is a delightful anachronism, a step back in time, with winding earthen footpaths to the fairway cut among hip-high fescue, rustic wooden bridges over water, and rough-hewn stonework surrounding the lakes and elevating several teeing grounds. No golf course can really be described with efficacy, but the Honors Course renders in sharp relief the ongoing futility of this profession. How can one begin to convey the serene ambience, the quietude, of this rolling, wooded meadow? The only sounds on this glorious acreage comes from the thwack of the golf ball, the occasional exultance after a great shot, the melodious birdsong and the plaintive cry of the Chattanooga Choo-Choo, rolling to the south.